Build a mission style library table for your favorite lamp. 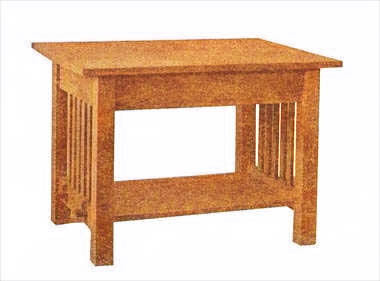 Clean design and sturdy construction of the Mission styling make this table a comfortable addition to any decor. Click here for detailed mission library table plans 1. If a planning mill is handy, the stock can be ordered to avoid planning and sandpapering. Of course if mill-planed stock cannot be had, the following dimensions must be enlarged slightly to allow for "squaring up the rough." For the top, use 1 piece 1-1/8 in. thick, 34 in. wide and 46 in. long. Have it S-4-S (surface on four sides) and "squared" to length. Also use sandpaper on the top surface, the edges and ends. For the shelf, use 1 piece 7/8 in. thick, 22 in. wide and 42 in. long, with the four sides surfaced, squared and sandpapered the same as for the top. For the side rails, use 2 pieces 7/8 in. thick, 6 in. wide and 37 in. long, S-4-S and sanded on one side. For the end rails, 2 pieces 7/8 in. thick, 6 in. wide and 25 in. long. Other specifications as for the side rails. For the stretchers, into which the shelf tenons enter, 2 pieces 1-1/8 in. thick, 3-3/4 in. wide and 25 in. long, surfaced and sanded on four sides. For the slats, 10 pieces 5/8 in. thick, 1-1/2 in. wide and 17 in. long, surfaced and sanded on four sides. For the keys, 4 pieces 3/4 in. thick, 1-1/4 in. wide and 2-7/8 in. long, S-4-S. This width is a little wide; it will allow the key to be shaped as desired. The drawings obviate any necessity for going into detail in the description. Fig. 1 gives an assembly drawing showing the relation of the parts. Fig. 2 gives the detail of an end. The tenons for the side rails are laid off and the mortises placed in the post as are those on the end. Care must be taken, however, not to cut any mortises on the post below, as was done in cutting the stretcher mortises on the ends of the table. A good plan is to set the posts upright in the positions they are to occupy relative to one another and mark with pencil the approximate positions of the mortises. The legs can then be laid flat and the mortises accurately marked out with a fair degree of assurance that they will not be cut where they are not wanted and that the legs shall "pair" properly when effort is made to assemble the parts of the table. The table ends should be glued up first and the glue allowed to harden, after which the tenons of the shelf may be inserted and the side rails placed. There is a reason for the shape, size and location of each tenon or mortise. For illustration, the shape of the tenon on the top rails permits the surface of the rail to extend almost flush with the surface of the post at the same time permitting the mortise in the post to be kept away from that surface. Again, the shape of the ends of the slats is such that, though they may vary slightly in length, the fitting of the joints will not be affected. Care must be taken in cutting the mortises to keep their sides clean and sharp and to size. In making the mortises for the keyed tenons, the length of mortise must be slightly in excess of the width of the tenon—about 1/8 in. of play to each side of each tenon. With a shelf of the width specified for this table, if such allowance is not made so that the tenons may move sideways, the shrinkage would split the shelf. In cutting across the ends of the shelf, between the tenons, leave a hole in the waste so that the turning saw or compass saw can be inserted. Saw within one-sixteenth of the line, after which this margin may be removed with chisel and mallet. In Fig. 3 is shown two views of the keyed tenon and the key. The mortise for the key is to be placed in the middle of the tenon. It will be noted that this mortise is laid out 1-1/16 in. from the shoulder of the tenon while the stretcher is 1-1/8 in. thick. This is to insure the key's pulling the shelf tightly against the side of the stretcher. Keys may be made in a variety of shapes. The one shown is simple and structurally good. Whatever shape is used, the important thing to keep in mind is that the size of the key and the slant of its forward surface where it passes through the tenon must be kept the same as the mortise made for it in the tenon. The top is to be fastened to the rails by means either of wooden buttons, Fig. 4, or small angle irons. Apply filler where needed, then stain as desired.